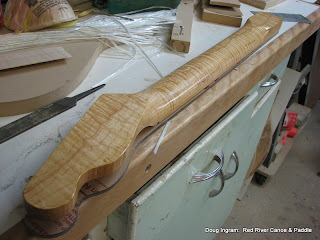 I got the Telecaster neck fretted and finsihed carving it. One coat of varnish reveals this beautiful flame figure. I wasn't thrilled with how the front turned out. The grain was "out of focus". 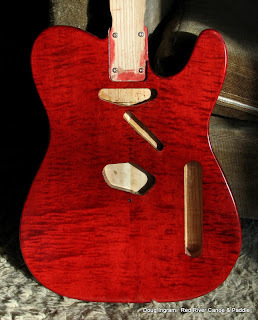 So I sanded the front down to bare wood and started over. Much better now. No matter how I photogaph it, its really difficult to photograph well.